A Turkish court on Friday sentenced former main opposition Republican People’s Party (CHP) lawmaker Eren Erdem to four years and two months in prison, reported the Turkish newspaper Sözcü. An Istanbul court handed the prison sentence to Erdem, who was put on trial over his work during his time as the editor-in-chief of Karşı newspaper. Erdem was acquitted from the charges of “revealing the identity of a secret witness” and “violating the confidentiality of a criminal investigation," but sentenced to prison for "aiding a terrorist organisation purposely and willingly without being involved in the hierarchy of the organisation". 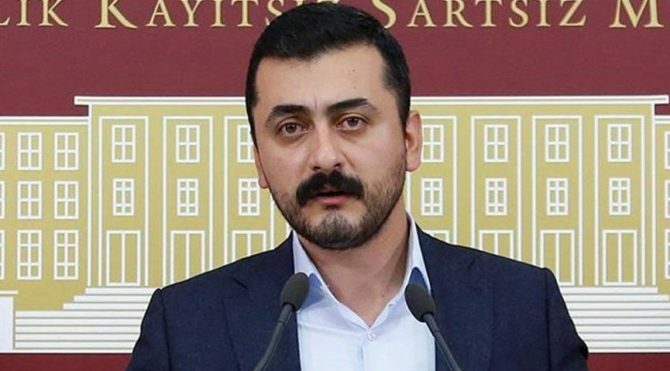 The 32-year-old former lawmaker is charged with links to the Gülen movement, which Ankara designates a terrorist organisation and accuses of masterminding the July 15, 2016 coup attempt. Erdem, a journalist-turned-CHP MP, has been on a hunger strike protest since Jan. 29 after a Turkish court rejected his lawyer’s appeal for his release. Following the trial, CHP lawmaker Barış Yarkadaş said on Twitter that the court's decision was "unfair and unlawful." "No words left to speak! Our friend Eren Erdem was sentenced to 4 years and 2 months in prison by the 23rd Criminal Court which ruled his release one month ago. Eren's imprisonment will continue. One more unfair and unlawful punishment on top of 246 days of suffering, as if that is not enough!" Yarkadaş said. In January, a Turkish court ordered the release of Erdem, however, following the ruling, Istanbul Chief Prosecutor Office objected to the release decision and a new arrest order is issued by a higher court as a precaution against Erdem's fleeing of the country. CHP’li Eren Erdem’e 4 yıl 2 ay hapis cezası! CHP’li Eren Erdem’e 4 yıl 2 ay hapis cezası! CHP PM üyesi Eren Erdem, yargılandığı davada "Silahlı terör örgütü hiyerarşisine dahil olmadan bilerek ve isteyerek örgüte yardım etme" suçundan 4 yıl 2 ay hapis cezasına çarptırıldı.